Florida's Director of Emergency Management, Bryan Koon, ran past his offices on Shumard Oak Boulevard Thursday morning, 29 November 2012, then continued running onto Esplanade Way and across the finish line of the FSECC 5K. Koon had just won the 12th annual 3.1-mile race in 17:06. Of course, there was still a full day of work ahead. "The good thing is, my office is right over there," said Koon. Koon was one of over 200 athletes participating in the Florida State Employees Charitable Campaign 5K. As you might guess from the name, many of them were state workers. For instance, the top woman finisher in the race, Stephanie Liles-Weyant, is from the Department of Health. Liles-Weyant finished 11th overall in 20:47 to claim her second straight FSECC 5K title. The runners lined up for the start on Esplanade Way at 8:30 AM. Before the first turn, 2010 FSECC champion Matt Dobson was leading the race. Dobson continued to set the pace going up the hill on Merchants Way, reaching the Southwood Town Center about 40 meters ahead of the next athlete, master runner Bryan Koon. Peter Kaus was another 50 meters back in third. Midway through the race in Southwood's Central Park, Dobson had widened the gap to 60 meters. But Koon would write a different story for the second half of the race. He began to close on Dobson, catching him just past three kilometers. "After that," said Koon, "I just ran for my life." Koon did more than that, defeating Dobson by over 100 meters, 17:06 to 17:30. Kaus held on to third with a 17:51. Michael Martinez finished fourth in 18:20. In the women's competition, master runner Stephanie Liles-Weyant, the defending champion, took the lead early, running ahead of Brook Pace. Pace had won the race in 2008 and 2010, but 2012 belonged to Tallahassee triathlete Liles-Weyant, who was never challenged on her way to a 20:47 win. Pace was the second female finisher, placing 14th overall in 21:30. Crawfordville's Melissa Hooke was the third woman across the line, 17th overall in 22:26. The fourth woman in and the second woman master runner was Julie Clark (21st, 22:53). It wasn't the 6,000 participants that had thronged the streets of Southwood seven days earlier at the Turkey Trot, but there were still 261 athletes who ran or walked the FSECC 5K. State workers in the race were able to designate their entry fee as benefiting the charity of their choice through the Florida State Employees Charitable Campaign. On Thanksgiving morning Chris Lake took time out from his studies at the University of Florida School of Medicine to outrace a field of 437 runners in Gulf Winds Track Club's 37th annual Tallahassee Turkey Trot 15K. It was Lake's fifth year in a row winning the 9.3-mile race through the streets of Southwood as well as his fastest Turkey Trot time yet, 49:53. No other athlete has cracked 50 minutes on the Southwood course; the last sub-50 Turkey Trot was Jessie Close's 49:12 in 1995, when the race was run from the Fairgrounds. While Lake collected his fifth Turkey Trot 15K title, Tallahassee lawyer Sheryl Rosen was grabbing her fourth. Rosen, who had won the women's division in the 15K each year from 2006 to 2008, returned to the winner's circle with a 57:27, finishing eighth overall. Asked to describe the conditions at the start of the Thursday morning race, most runners answered, "Perfect!" It was clear, calm, and cool, optimal for distance running. Lake trailed initially; at the mile mark he was six seconds behind Caleb Carmichael, an assistant cross-country coach at the University of West Florida. Lake pulled even, and at the halfway point he and Carmichael were running side by side, far ahead of the rest of the field. With just over three miles to go, Lake made a move, something he had been practicing. "I've been trying to work on picking up the pace the last few miles in races," he explained. It was effective. Lake broke away from Carmichael and went on to win by nearly 300 yards, 49:53 to 50:47. The rest of the field was way behind; third-place runner Roger Schmidt was almost three-quarters of a mile farther back in 55:01. Maclay School coach Gary Droze was the fastest master runner in the field, finishing fourth overall in 55:34. Sheryl Rosen led the women's field from wire-to-wire, but that's what you would expect of a runner who finished a 9.3-mile race with a 1.3-mile lead. That's how far Rosen was ahead of the women's runner up, 2010 Turkey Trot 15K champion Allison Eagen. Eagen ended the race 34th overall in 66:44. At 67:15 Karen Geletko was the third woman finisher. Jane Johnson ran 67:19 to finish as the first woman master for what may have been the 11th time--it's hard to keep track, especially when three of those top master finishes were among the four years that Johnson won the women's division outright. The Tallahassee Turkey Trot doesn't include quite as many different races as a track meet, although sometimes it seems that way. A 10K and a 5K shared the 8:30 am start of the 15K, and over 900 folks started a one-mile fun run at 8:00 am. Close to 5,000 started in the three longer races. Crawfordville's Stanley Linton won the 10K with a 33:15, finishing over a quarter mile ahead of runner-up Nate Kaiser's 35:05. Stefanie Slekis was the first woman and third finisher overall, running 36:05. Former McNeese State University distance runner Ryan Barrow won the 5K race in 16:02, comfortably ahead of runner-up Kevin Hicks' 16:17. Florida State's All-American distance runner Violah Lagat won the women's division with a third overall 16:26. Only five days before the Turkey Trot, Lagat had placed eleventh in the NCAA Women's Cross-Country Championships. The sheer number of runners was unprecedented for Tallahassee, with almost 6,000 trying to crowd into Southwood. If you’re planning on running next year, make a note to arrive early. And if you’re planning on competing with the likes of Chris Lake next year, make a note to start training now. Tallahassee's Vince Molosky extended his Draggin' Tail 18-mile challenge winning streak to four races at the 18th annual edition of that event on Saturday morning, 17 November 2012. Molosky covered the course through the streets of Sunny Hills, Florida in 1:47:47, finishing the 18 miles before any other runner in the race had gone even 16 miles. It was the fastest of the four Draggin' Tail wins that Molosky had collected from 2009 to 2012. Gabriel Garza was the next runner across the finish line, putting up a 2:01:46 for the rolling 18 miles. Sean Smith took third in 2:19:20. Tallahassee's Chuck Davis was the fastest master runner in the race, finishing fourth in 2:21:04. The next master runner in was Tallahassee's Mike Burns, fifth in 2:25:46. Panama City Beach distance runner Amy Mann's 2:27:38 wasn't quite as fast as the 2:27:01 that she ran at the 2008 Draggin' Tail, but in 2012 it was good enough for sixth place overall and first female honors. Mann finished the race a comfortable 250 meters ahead of the women's runner up, Debbie Wittmer, who was eight overall in 2:28:58. 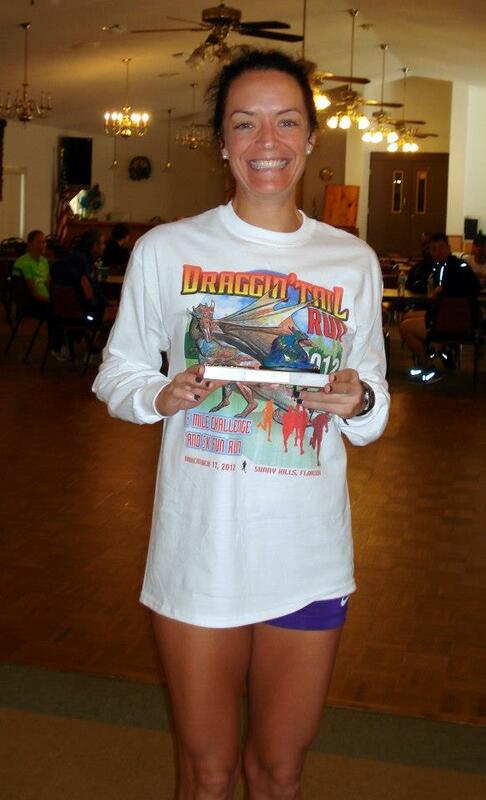 Wittmer was the first master woman in the 2012 Draggin' Tail. The number of participants at the Draggin' Tail was slightly down from the previous year, which was already lightly attended. 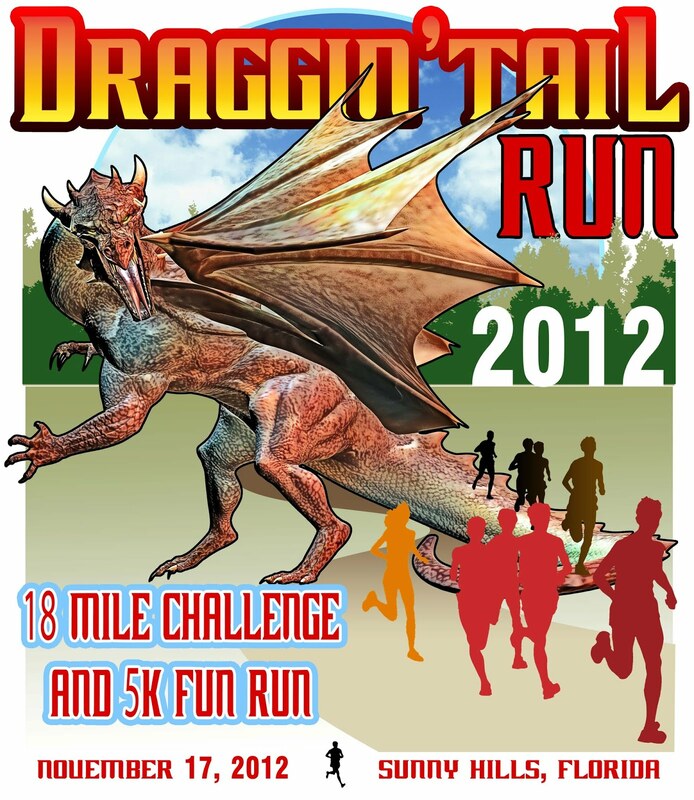 With only 35 finishers in the 18-mile challenge, plus six 3 x 6-mile relay teams and 17 finishers in the 5K, the Draggin' Tail seems on the verge of becoming as extinct as the dragons that grace the race trophies and T-shirts. Athletes who love this event should start training for the 19th annual race (23 November 2013) and plan on bringing a friend or two. The big college sports story today is that the University of Maryland is leaving the Atlantic Coast Conference to join the Big Ten. This isn't really sports, but it gives ACC beat writers a chance to poke fun at Maryland, and ask which 10 of the Big Ten's 14 member institutions are actually big. After that, there will be the usual speculation about how this will affect conference play in basketball and football, and far flung fantasies about which schools might take Maryland's place. It doesn't look like anyone would notice that the Terrapins had left. Things weren't always that way, though. From 1954 to 1980, Maryland won the ACC men's indoor title 26 times. From 1954 to 1981, the Terrapins took home 26 ACC men's outdoor titles. It would be easier to count the few years that Maryland didn't win. Maryland was less dominating in cross country during this period, but the Terrapins still grabbed 11 conference titles in men's cross-country from 1954 to 1976. Certainly, the Maryland men had their glory days in track and cross country--glory days that included the NCAA career of the great UMd alumnus, Renaldo Nehemiah. Unfortunately, those days seem to have ended three decades ago. Three decades ago is about when women's athletics was being begrudgingly recognized by the dinosaurs who ran college sports. The first ACC women's cross-country championship was held in 1978, and the Terrapins placed second behind. They never finished that high again. The conference added an outdoor track -and-field championship for the women in 1983. Once again, Maryland was second at the inaugural meet, and could only dream of placing runner-up after that. The ACC championship for women's indoor track and field was first held in 1987. The best performance by the Lady Terps has been third, where they placed three times, but not during the 21st century. So it's not that the University of Maryland has never been a factor in ACC track and cross country, it's that they haven't been a powerhouse for a long, long time. Most of the athletes who built that tradition are old enough to be collecting Social Security. As far as the running sports are concerned, the Terrapins aren't likely to any happier in the Big Ten, either. Yes, Jesse Owens left Ohio State a long time ago, but the Big Ten has maintained their track-and-cross-country traditions since then. Right here in Tallahassee, you can ask FAMU track coach Wayne Angel (Illinois, c/o 1982), FSU track coach Karen Harvey (Michigan, c/o 1996), or Capital City Runners proprietor and three-time Olympian Kevin Sullivan (Michigan, c/o 1998) about the level of competition in the Big Ten. They know. Starting with the 2014-2015 seasons, Maryland's lane will be open in events at the ACC championships. There is a chance, though, that the lane would have been open anyway. Maryland has already dumped its men's cross-country program, and the men's track-and-field program is scrambling to raise money to fund its survival. As usual, budget concerns and Title IX are the reasons cited for men's track-and-field being on the chopping block. Like most schools, though, there's only one sport that you could cut at Maryland to balance the budget and achieve Title IX compliance. It's not track, and it's not cross country. But it does share a season with cross country. Following the 2009 season I first put together a list of cross-country titles won by Leon County schools since the beginning of time. Well, since 1947, which is when Florida first began holding state championships in high school cross country. Which seems late to be coming to the table, but the NCAA national championship in cross country only goes back to 1938. So now the question becomes not what's wrong with this state, but what's wrong with this country? It seems appropriate that this list would need to be updated after 2012, the first year that Tallahassee hosted the FHSAA state cross-country championships. It wasn't Tallahassee's finest year at the state cross-country meet, but the schools in the area did represent. In the class 1A boys' race, the Tallahassee Maclay boys took home second-place hardware, scoring runner-up behind Holy Trinity. Griffith Rutherford of Tallahassee North Florida Christian (4th, 16:06.05) took home an All-State medal, as did Tallahassee Maclay's Travis Covert (8th, 16:18.45). In the class 2A girls' race, Tallahassee Maclay placed tenth, with Maclay's Kristin Sweeney (7th, 19:01.69) earning All-State decorations. Two Leon County teams cracked the top ten in class 3A, with Tallahassee Leon placing sixth with 199 points and Bradfordville Chiles taking seventh with 213. Tallahassee's fastest individual in that race was Leon sophomore Sukhi Khosla (13th, 15:58.60). The Chiles girls placed third in their class 3A race. The performance that requires this list to be revised also came from that race. Chiles senior Rachel Givens won the 2012 FHSAA-3A girls' cross-country title, running 17:48.78. Givens joins Carly Thomas as one of two Chiles girls to win the state meet. No school in Leon County has had more than two girls cross-country champions. Most schools are waiting for their first. Congratulations to everyone. And for the returning runners--when you're putting in base mileage in July, and the weather just isn't cooperating, remember that the State Meet in November isn't that far away. And it's in our house. Tallahassee master runner Tony Guillen turned a course-record 17:55 to win the fourth annual Bradley's Country Store Family Fun Days 5K on Saturday morning, 17 November 2012. Guillen finished with a lead of nearly 300 meters, but runner-up and 2010 Bradley's 5K champ Cole Tessier didn't enjoy such a comfortable margin. Tessier had to outkick master runner Geb Kiros for second place, 18:17 to 18:19. Rachel Rumana, a cross-country runner on the Holy Comforter Episcopal School team, was the first female in the 3.1-mile race, placing 14th overall in 24:11. 120 meters behind Rumana, Sondra Lee took 17th in 24:37, finishing as the second female and first female master. The race had 55 recorded finishers, all running the out-and-back course on Old Centerville Road with visions of Bradley's sausage dogs jogging in their heads. The Marzuq Shrine produced the event, a sort of sister race to their annual Mother's Day 5K in the spring. Unlike most road races, there is no T-shirt for finisher's or registrants at Marzuq's fall 5K, but each finisher gets a Bradley's sausage dog--which, conveniently enough, only come in one delicious size. 2011 story, "Piotrowski and Jackson have the most fun at Bradley's 5K"
2010 story, "Tessier, Liles-Weyant spoil everyone else's fun at Bradley's Country 5K"
"I haven't been able to race much lately," said James Taylor. "I've had drill on the weekends." The master runner from Perry, Florida didn't need to worry about being rusty, though. At Tallahassee's second annual Allen Beal Memorial 5K on Veterans Day, 12 November 2012, Taylor finished at the front of a field of 115 athletes, recording a 19:12 on a 3.1-mile course through the hills of Myers Park and the downtown area. About 80 meters behind Taylor, Peter Falcone placed second in 19:31, while Chuck Lang and Charlie Lang were third and fourth respectively in 19:43 and 19:56. Kelly Brennan was the fastest woman finisher, placing seventh overall in 21:34. Top woman master honors went to Paula O'Neill, the fifth woman finisher and 23rd runner overall in 24:15. The race started on South Gadsden Street at East College Avenue, from where the runners quickly descended to Franklin Boulevard--one of the lowest points in town if flooding is any indication. After that, the race climbed into the Myers Park neighborhood, making it all the way up to the Old Fort, built on high ground during a fit of Civil War anxiety. Heading up Lafayette Street, less than 800 meters into the race, James Taylor found himself in the lead. "I was wondering where all the runners were," Taylor said after the race. 114 runners were behind him, with the closest, Peter Falcone, already 40 meters back. Taylor maintained that margin over Falcone through the streets of Myers Park, then widened the gap on the climb to the finish line on Gadsden Street at Park Avenue. There was more of a battle for the women's title. Kelly Brennan and Lindsey Pfau turned off of Lafayette into the Myers Park area racing side by side, leaving the rest of the women's field well behind. Neither could gain an advantage over the other, though, until the four-kilometer mark, just before leaving Myers Park, where Brennan opened a gap. From there, Brennan raced home, building up a lead of more than 100 meters and defeating Pfau 21:34 to 22:06. Shannon Colavecchio moved up through the field to take the third woman's spot in 23:36. At 24:05, Swift Creek Middle School cross-country runner Arianna Neely was the fourth female finisher. In a duel of master runners, Paula O'Neill outran Fran McLean 24:15 to 24:46 for the fifth female position. Part of Tallahassee's VetFest, the annual race was first held in 2011 as the Tallahassee Veterans Day 5K. It was renamed this year in honor of the late Allen Beal, retired United States Army first sergeant and VetFest's first parade Grand Marshall in 2010. The race course also changed slightly from the first year, but no one reported that there were any fewer hills. Whatever changes are in store for the third year of the race, you can count on the date of the event--Veterans Day 2013. 2011 story, "Veterans Day victories for Smyth and Holt"
BARC Humane Society 5K. 8:00 AM ET. 1605 Azalea Drive, Valdosta, Georgia 31602. Entry form and flyer. 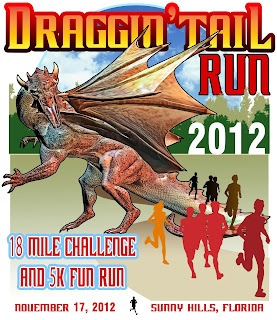 Online registration at RunSignUp.com. Chelsea Bartholomew, cbbartholomew@valdosta.edu or 678-428-0733. EagleFest Dash For Cash 8K, 5K, and one-mile fun run. 8:00 AM CT. Providence Christian School, 4847 Murphy Mill Road, Dothan, Alabama 36303. Event web page. Online registration at OneStopRace.com. pcseaglefest@aol.com or 334-702-8933. Turkey Trot 10K, 5K, and one-mile fun run. 9:00 AM CT. Fort Rucker Physical Fitness Facility Bldg 4605, Andrews Avenue, Fort Rucker, Alabama 36362. Entry form and flyer. Kristi Fink, kristina.l.fink.naf@mail.mil or 334-255-0308. Swine Time 5K. 8:30am ET. Swine Time Fairgrounds, New Street, Climax Georgia. 2011 story. Entry form and flyer. Paul Fryer, pfryer1@gmail.com or 229-246-8560 or Chip Ariail, dariail@dcboe.com or 229-243-9120. In Florida high school athletics, in order for a team to compete for a state title in cross country, they must first earn a spot in the championships by having a top six finish at a regional meet. Of course, you can't even run in a regional without first qualifying in a district meet, but the regional is the final test. On Saturday morning, 10 November 2012, the class 1A, 2A, and 3A schools of FHSAA Region 1 sent their teams to Tallahassee to fight for a spot in the state meet on 17 November 2012. Only the class 4A schools were absent, making Tallahassee's Region 1 meet almost as big as the state championships. Unfortunately, the state championship course at Apalachee Regional Park was unavailable, so Chiles High School hosted the six Region 1 races at Sunny Hill Farms, a beautiful venue northeast of Tallahassee near the intersection of Centerville Road and Roberts Road. Regional competition opened at 8:00 AM ET with the Region 1-3A girls' race. During the second mile Chiles senior Rachel Givens broke away and established a lead, getting more than ten seconds ahead at one point. Rachel Kling of Pace worked up to second place during the third mile and was actually closing on Givens late in the race, but it was Givens who took the Region 1-3A girls' title, 18:33 to 18:40. Fort Walton Beach runners Ivy Chastain and Emma Rudman took third and fourth in 18:50 and 18:55, setting up Fort Walton Beach's team total of 70 points--good enough for the Region 1-3A championship. Chiles was runner-up with 92 points, with Creekside (121), Bartram Trail (122), Nease (147), and Ridgeview (177) also advancing to the state meet. The class 3A boys race was initially an Okaloosa County affair, with Niceville juniors Thomas Howell and Nicholas Morken dashing to the front followed by a pack of four Fort Walton Beach runners. Howell and Morken proceeded to run away from the field, but just before two miles Leon High sophomore Sukhi Khosla passed the Fort Walton Beach quartet. Howell went on to win in 15:26, with Morken runner-up in 15:34 and Khosla third in 15:54. Fort Walton Beach's front four lost ground in the last mile, but still finished well enough to form the nucleus of their team's 49-point Region 1-3A victory. Leon took home the second-place trophy with 90 points. 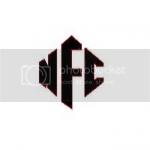 Chiles (120), Niceville (156), Creekside (175), and Pensacola Washington (198) were the other four teams that punched their tickets to the state championships. Mikayla Hodges and Michaela Ashley of Panama City Arnold led the Region 1-2A girls' race early, but by the mile mark Bolles frosh runner Mackenzie Wilson had taken over the pace. After that, the race belonged to Wilson; she led the rest of the way and crossed the line with an 18:48 win. Hodges (19:14) and Ashley (19:17) took the next two places for Arnold. Bishop Kenny's Mary Thyfault was fourth in 19:24, but the next three places--Allison Hajda (19:33), Lilliana Arnold (19:34), and Rachel Shapiro (19:34)--belonged to Bolles, giving the school 29 points and the Region 1-2A championship. Bishop Kenny finished runner-up behind their cross-town rivals with 64 points. Also advancing to State were West Florida (108), Gainesville Eastside (128), Pensacola Catholic (143), and Arnold (167). For the other teams, the 2012 cross-country season was over. What Jacksonville Bolles did in the Region 1-2A girls' race, Jacksonville Bishop Kenny nearly did in the Region 1-2A boys' 5K. Kenny's David Yarbrough went right to the front and stayed there, leading nearly the entire race en route to a 16:25 win. Yarbrough's teammate, senior Michael Barr, ran in second for a while, but before the end of the second mile Jacksonville Episcopal's Kentre' Patterson moved into second. Patterson held that position till the last quarter mile, when Alec Clark of West Florida passed him. Clark went on to finish runner up in 16:30, while Patterson was third in 16:33. Including Yarbrough, Bishop Kenny put five runners in the top twelve, scoring a winning total of 36 points. West Florida snagged the second place trophy with 80 points. Jacksonville Bolles (131), Pensacola Catholic (135), Jacksonville Episcopal (145), and Gainesville Eastside (173) claimed the remaining four berths to State. The penultimate Region 1 championship race on the slate was the class 1A girls 5K. At the quarter mile, Jacksonville Providence runners held four of the top five places, with Providence junior Eden Meyer leading the entire field, just ahead of her senior teammate Danielle Dunn. But that was early in the race, and 3.1 miles is a long way. By the end of the first mile Maclay's Kristin Sweeney had moved into third, and by the end of the second mile she had passed Dunn, trailing only Meyer. Meyer was way ahead by then, though, and took the Region 1-1A title with a 19:27. Sweeney was second in 19:58, and Dunn held onto third with a 20:15. Meyer and Dunn led Providence to a team score of 49 points and the Region 1-1A championship. Tallahassee Maclay edged out St Johns Country Day for the runner up spot, 73 to 74. Jay (128), Rocky Bayou Christian (169), and Aucilla Christian (183) also qualified for the state championships. Region 1 competition at Sunny Hill Farms closed with the class 1A boys race. North Florida Christian's Griffith Rutherford was the early pacesetter, trailed by Hunter Potts of Graceville and Travis Covert of Maclay. After two miles Potts had shaken off Covert, but Rutherford continued to lead. Rutherford got the win with a 16:05 and Potts was second in 16:15. Jack Rutledge (16:59) and James Connor Daughton (17:01) took the next two places for Maclay, putting their team on the road to a score of 43 points and the Region 1-1A title. Pensacola Christian Academy placed runner-up with 88 points. Bishop Snyder (93), North Florida Christian (152), Christ's Church Academy (158), and Wewahitchka (201) also earned a box on the starting line of the state championship. An open 5K at the start of the morning and another open 5K at the end of the meet added to the excitement, as did two deer that came crashing out of the woods during the class 3A girls race, flushed from cover by the leaders. One headed across the fields, while the other ran through a fence, dashed across Roberts Road, then leaped another fence to disappear into a forest of young pines. "That's something you won't see at a football game," commented an awed spectator.